From high above, it all seems so peaceful. Just sand and rock and clouds. Just endless desert wrapped in a still, boundless silence. This is what Afghanistan looks like in a series of satellite views that serve to transition us through the startling and intimate war documentary, 'The Battle for Marjah.' More than just mere establishing shots, however, these celestial vantage points actually serve another stylistic and contextual function -- perspective. Throughout the film's running time we are presented with a close, personal view of violent conflict, strapped right into the shoes of the soldiers on the ground, thrust into their external and internal struggles with enemies and civilians. It's a visceral, enlightening, and sometimes disturbing journey, but when we momentarily break from the firefights and political maneuverings on the sand, and cut to the high, overhead shots of quiet wasteland, we suddenly realize how small we really are, and how from an aerial view one would never dare guess what horrors, pains, and occasional triumphs lurk far below. The documentary follows an American-led military operation that was launched on February 13, 2010 to secure the southern Afghanistan town of Marjah. With the region under Taliban control, marines were sent into the area to enact a new counterinsurgency strategy that unfolds in four steps. First the soldiers are to clear out the enemies, then hold the seized ground, build infrastructure, and finally transfer power to the newly trained Afghan forces. The film subsequently follows the marines as they attempt to do just that, and through an intimate shooting style, we get a rare and raw look at the American military machine in action, both in combat and in the important moments afterward. The film begins with a series of newsreel clips and stock footage snippets that effectively build a visual rhythm and set up the conflict and objectives for the mission. An interview with Captain Ryan Sparks, rounds out the introduction and from here we are mostly thrust into a purely visceral, fly-on-the-wall perspective, that presents the events in a raw but still extremely potent manner. Periodic title cards signal the shifting days of the endeavor and detail various mission goals, and occasional on-screen maps illustrate strategy, weaving a narrative through the action. Various shots from helicopter rides and the aforementioned aerial views are all married to a somber, escalating score, acting as the film's transitionary connective tissue while establishing a pervading solemn mood. As the marines engage in their mission, breaking out into sporadic firefights and skirmishes while they secure the hostile region, the camera follows close by, providing the audience with a ride-along experience. Shaky angles, POV shots, and various other stylistic flourishes are both functional and dramatic, giving the proceedings an authentic and interesting visual syntax. Various interviews with the marines are peppered in throughout during breaks in the action and right in the thick of conflict, presenting an unfiltered and honest view of their opinions and state of minds. Dealing with some very complicated, sensitive, and sometimes disturbing subject matter, the film manages to present the material in a respectful and mostly unbiased manner. Yes, there are a few editing choices and areas of focus that definitely demonstrate a specific political leaning, but this isn't a negative or positive propaganda exercise. The movie is simply about presenting the actions as they occurred, allowing the viewer to draw their own conclusions on these very complex issues. Through the various steps of the mission, from the initial skirmishes, to the eventual securing of the area, and the subsequent rebuilding efforts, we get a multifaceted peek into the minutia of military protocol and get a firsthand look at their possible successes and failures. While there are instances of violence, including one particularly disturbing look at the aftermath of a successful takedown of an enemy sniper, one of the hardest scenes to watch doesn't actually feature any gore or bloodshed at all. After an innocent family is mistakenly killed during an operation, we follow several marines as they are charged with visiting the surviving members in order to offer them a monetary "condolence payment." The scene is uncomfortable to witness and is filled with many mixed emotions on all sides. Watching the soldiers struggle to come up with the least offensive way to present such a paltry offering, and then observing the surviving family members reactions as they accept the payment, is painful. There is guilt, shame, anger, and grief, on all sides and the sequence is one of the most telling and long lasting scenes in the film. As the soldiers risk their lives to rid the region of Taliban influence, they are greeted with both heated opposition and restrained acceptance by the civilian population. Theirs is an unfortunately thankless job, and while the documentary's early action focused footage is certainly interesting, its later sequences involving the rebuilding process and aftermath of the mission are just as significant. While I would have actually liked to see more material on these post-battle events, what is presented is certainly thought provoking. This isn't an easy process, and though there are indeed short term successes with the strategy employed, the long lasting affects look much more bleak, and as much of what these soldiers struggled to achieve is slowly undone, we are ultimately left with a fairly grim outlook on the entire war effort. 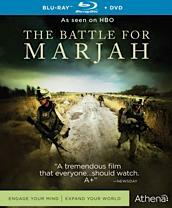 'The Battle for Marjah' is an honest, powerful, and sometimes disturbing documentary that blends an intimate focus on the battlefield experience with an interesting examination of the rebuilding process. Taking out the enemy is only the first step in the counterinsurgency strategy, and here we get a personal look at the full progression of events, providing a much larger picture. While the overall outlook certainly waivers toward a pessimistic opinion of our efforts, this isn't a political smear on the American war strategy. It's merely an account of the realities these soldiers faced. On the ground, in the thick of it all, through their interviews and actions, we see them struggle with all the mixed emotions of battle, ranging from fear and exhaustion, to unending frustration, and it all effectively paints a multifaceted and interesting portrait of war and the sometimes disappointingly impermanent affects of our hard fought efforts. Athena presents 'The Battle for Marjah' in a Blu-ray/DVD Combo Pack. A single BD-25 disc and a DVD copy are housed in a standard case with a cardboard slipcover. A twelve page viewer's guide is also included in the package that contains articles on the history of Afghanistan, Osama bin Laden, the Taliban, counterinsurgency warfare, and the U.S. Marine Corps. After some trailers the disc transitions to a standard menu. The documentary is presented in a 1080i/AVC MPEG-4 transfer in the 1.78:1 aspect ratio. Shot digitally in high definition, this is an uneven but serviceable presentation that understandably varies depending on shooting conditions. The source is mostly clean but does feature various, minor artifacts. Noise is visible, especially in low light and night vision scenes, and some aliasing, shimmering, and pixilation are all apparent periodically but not excessively. While the majority of the footage comes from an HD source, there is also some intermittent upscaled stock material culled from various news broadcasts. Detail can be very strong, especially in close-ups, but clarity does change on a scene by scene basis. Some shots look a lot more low grade than others, and some sequences appear very soft and flat. One of the main drawbacks of the video presentation is its contrast levels. The image often appears very blown out and overexposed, creating a washed out look that lacks pop. This is of course understandable considering the documentary was shot in the middle of a bright, hot desert, but it doesn't make for a very appealing image. Colors are also fairly drab and the footage is pretty monochromatic in appearance due to the location's inherent lack of visual variety. Black levels are fine but rarely much of a factor since the majority of the footage is set during the brightly lit day. The film's uneven appearance is most likely a combination of the difficult and unavoidable shooting conditions and technical quirks of the equipment used. While the doc can occasionally have strong levels of detail, it suffers from some obvious limitations. Still, the raw, rough look compliments the content well. The movie is provided with a DTS-HD Master Audio 5.1 track, a Dolby Digital 5.1 track, and a PCM 2.0 track with optional English SDH subtitles. Surprisingly robust and immersive for a documentary, this is an unexpectedly strong audio mix. Like the video, there are some inherent limitations here, and quality does vary from sequence to sequence depending on conditions. With that said, dialogue is usually clean and easy to understand, but can get muffled in the thick of battle. What really makes this track stick out, however, is its wide and enveloping soundstage. There are several tense moments where firefights breakout and various effects, including helicopters, bullets, and explosions, burst from all around with distinct separation and fairly strong imaging, placing the listener right in the midst of the skirmishes. Bass activity is also pretty strong, giving the various explosions weight and depth. Balance between all of the elements is handled well, and the filmmakers do a good job of prioritizing speech or effects when appropriate. While the mix doesn't come close to Hollywood produced efforts, this isn't a fictional action epic, this is a true account that utilizes real sounds. While surely remixed, spruced up, and perfected in post, the effects are still seemingly indicative of recordings during actual events, and the level of immersion presented is quite impressive considering. Athena has included a small assortment of text only supplements. While the information provided is decent, some background on the documentary's production or additional material would certainly have been welcome. Timeline of the Afghanistan War - This is exactly what it sounds like and is a text timeline of the major events that have occurred during the war. Biography of Ben Anderson - This is a brief text bio of the filmmaker. 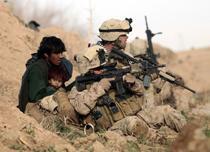 Biography of Photographer Goran Tomasevic - This is a brief text bio of the photographer. 'The Battle for Marjah' is a tense and thought provoking account of our military's counterinsurgency strategy. Through the personal experiences of the marines on ground, during battle and rebuilding, we are presented with an honest and sometimes solemn look at the harsh realities of war. The video transfer does show off some inherent limitations. but it still serves the doc well, and the audio is surprisingly immersive. Supplements are sparse and only text-based, which is a disappointment. Still, this is a strong documentary that comes recommended.